Today, the entire world will come together and celebrate our planet! The Earth Hour movement, which is supported by WWF, started in Sydney, Australia in 2007. Since then, more than 7,000 cities around the world joined in. This event helps us realize that our planet has no boundaries, no religions, and no separations. It is a breathing ecosystem, and we are all a part of it. What a wonderful message to remember! To join this movement, all you have to do is turn off your lights at 8:30PM! I’ll be sharing pictures of this on our Facebook/Twitter accounts. 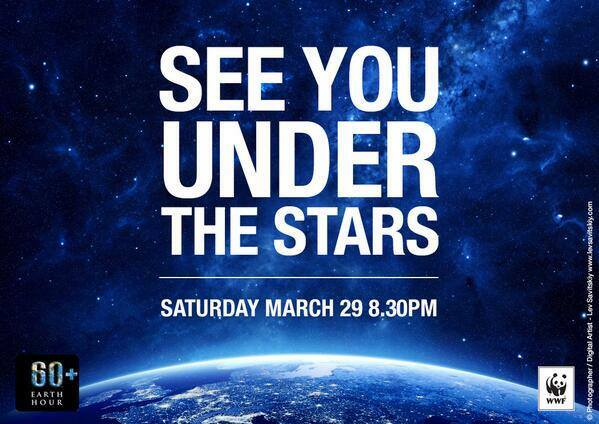 So join in and tweet with us for #EarthHour day! Posted on March 29, 2014 by saynotofoodwastePosted in NewsTagged climate, Earth Hour, energy, global community, happy, nature, planet, sustainbility.